Rebekka Seale is a fiber artist that cares deeply about the natural world and knows intrinsically that natural beauty is always the best kind. Her yarns are hand dyed with plant and mineral based dyes or left to be in their natural state. As owner of a small company spinning these gorgeous yarns in small batches, Rebekka is diligent about sourcing her wool from alpacas raised on reputable farms in the southeast, like Arcadia Alpacas in middle Tennessee. Rebekka loved the feel of organic, alpaca wool the moment she touched it and began to work with it. That began a passion of learning to dye the fibers and spin them too. The dying process is something I know I'd have so much fun with too as she soon discovered how items like marigold petals, coffee, berries, nuts, red cabbage and turmeric released the loveliest hues and tones. As she shared, "Naturally dyed fiber can be one color in sunlight and another entirely in the shade. It almost seems to shimmer." As nature is always our best teacher, she's also well aware of how the naturally dyed fibers tend to work together seamlessly. Before I left this beautiful space, Rebekka and Lisa told me about an upcoming workshop in August that's called Knitting for the Home: Floor Mats. I think I immediately gasped at the thought...so I am going to try very hard to make the trip up to Nashville for this fun Sunday afternoon workshop. But if you're one of the lucky ones who live in or around Nashville, sign up for one of their ongoing and ever changing lineup of fantastic workshops, classes or private lessons in the lovely studio and retail space, Earthen, which Rebekka shares with Soñadora and Golden Apothecary. 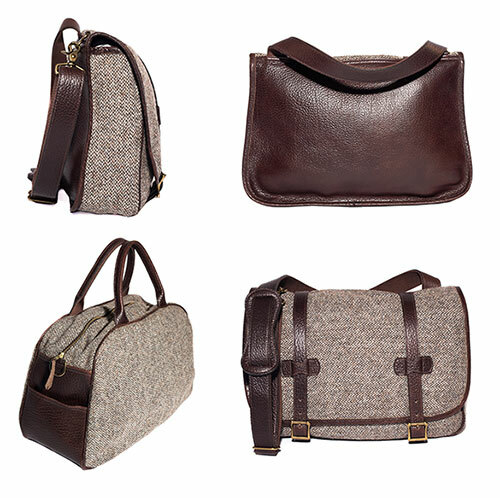 Thomas Wages, the owner of Tweeds, designed these gorgeous messenger and weekender bags made from a mix of full-grain buffalo leather, solid brass hardware and high quality fabrics - like this one, made from Harris Tweed via Scotland. Every time I go into the Tweeds shop in Atlanta, I find my way over to these bags and just rub my hand over them slowly- part curiosity, part creepy obsession. This makes me realize this morning, how overdue I am in writing this blog post. Thomas created such a unique and beautiful bag collection available in shop or online. Take a gander, here.